Bitcoin went down 15%, losing $15 billion of market cap in a flash last week. We're not focused on every gyration of the markets, but this case deserves analysis. 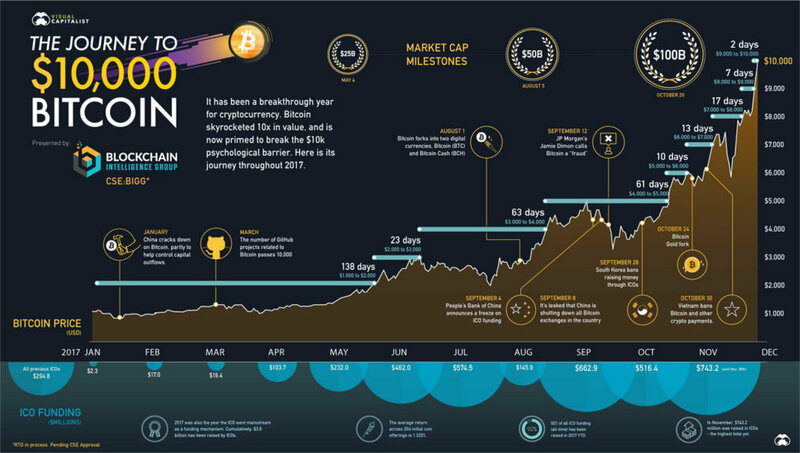 The first quick point is that there are four major components of BTC value we see: (1) secular, permanent adoption of blockchain technology across every use-case, (2) the proliferation of new crypto assets that reduce the use-cases that BTC satisfies, (3) a team's operating ability to grow and maintain the network, and (4) the financialization of the sector. Putting aside (4), we can say that the more stablecoins succeed at payments, the less BTC will be the medium of exchange; the more smart contracts platforms grow DApps, the less BTC will be programmable; the more XPR banks use, the less BTC they are likely to adopt. But there are massive tailwinds in the secular shift for the sector overall, which should counterbalance increased specialization. Smaller pie slice, bigger pie. Which brings us to operating execution. On November 15th, Bitcoin Cash, a fork of Bitcoin that was about 10-20% worth of the parent, underwent another fork, while making the headlines for major personality conflict between several crypto billionaires. The split is by now a familiar story -- trying to solve for scale using (1) new concepts that are additions to the "original" protocol (Scalia would be proud! ), or (2) just increasing the blocksize again. Depending on what asset you own (a mining pool, a manufacturer of chips, merchant processor), software decisions drive economics in your other assets. And there is also the opportunity to be Internet_King, ruling over an open source protocol and being written in the history books as a progenitor of digital money. Forking is an interesting experiment. Believers in the homo-econonomicus - that mythical creature of marginal utility maximization, see forks as a reasonable voting mechanism for deciding human policy. 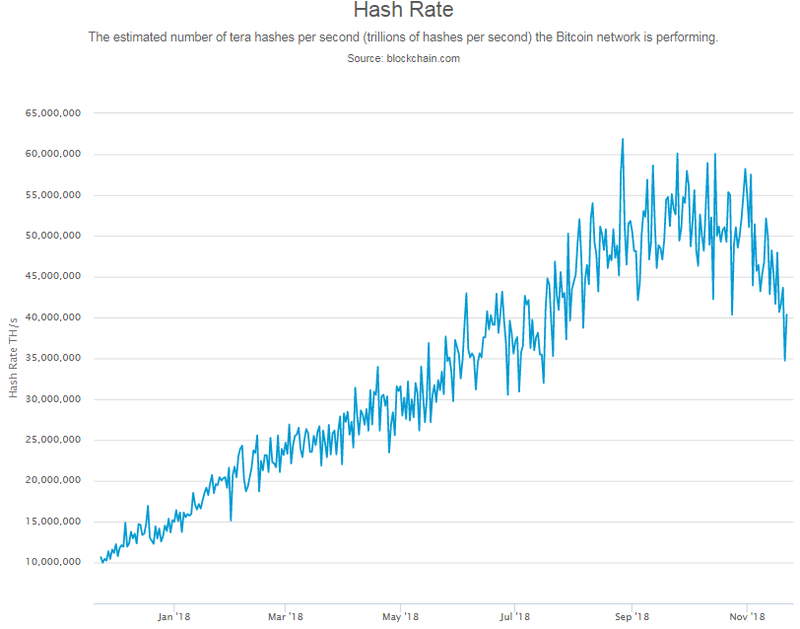 We agree that it's neat to see hash power from collective mining pools be directed as votes for software versions. But this is a naive view of human collective decision making. Imagine a constitutional democracy where any petty disagreement -- between oligarchs controlling private oligopolies mind you -- lead to a secession of states, currencies, systems and assets. No requirement or need for forced compromise. If you want to build a network that flows across nation states to lift people into techno-utopia, endless fractal splintering facilitated by no meaningful governance is not the way. Using either the logic of Metcalfe's law to say that network value falls exponentially with each node removed, or the logic of corporate spin-outs to say that some minimum entity size is important (you shouldn't spin out all your employees into LLCs, looking at you Uber), suggests that BCH's fork was a bad idea. This had a $15 billion effect on Bitcoin proper. Perhaps some of the aspirants needed to liquidate assets to wage a hash war, mining 51% of empty blocks on their opponent's chain to break their asset. Or perhaps there was simple confusion, or a desire to sit out the volatility, on the part of investors. Regardless, Bitcoin Cash ABC is trading at 5% of BTC, and Bitcoin Cash SV is at about 3% of BTC. Hard to see the future of money in there. Literally everyone around us is either trading crypto or starting crypto companies. Two conclusions are possible: (1) from now on all startups are crypto startups, like all tech startups use Web and Mobile, and (2) people are chasing the dragon because it's a dragon. Checking in with investors that have gone through the DotCom experience, most say that it feels like 1997 -- where both the excitement and the bad decision-making are palpable and public. So what are the key symptoms? 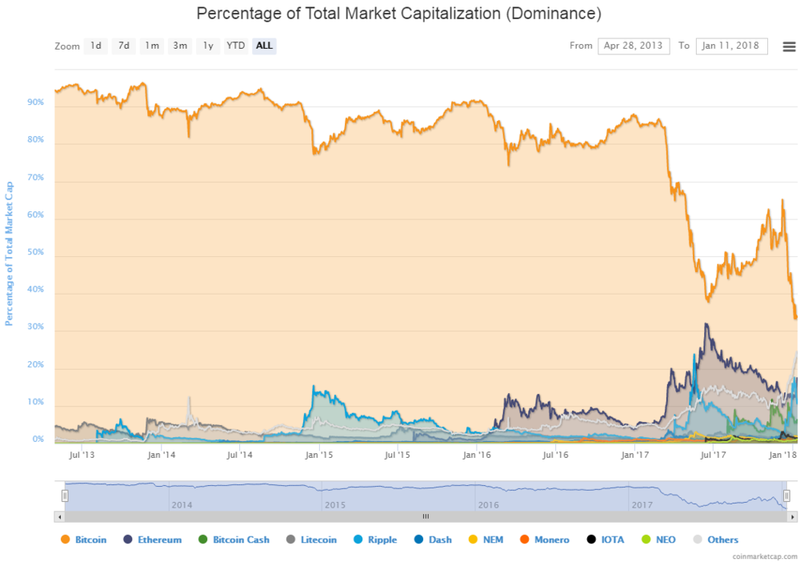 The first data point is that the mainstream excitement about crypto has shifted from Bitcoin into alternative cryptocurrencies, i.e., alt coins (XRP, IOTA, ADA, TRON, ICX, etc). The reason is simple. Many people have onramped from fiat into crypto via Bitcoin in 2017. But you you have to believe some wacky things to get Bitcoin to increase 100x from here. With tradeable coins that have a $50-500 million marketcap, it is still possible to imagine (rightly or not) those 100x returns. And in fact, there is a cottage industry of Youtube personalities that keep publicly available spreadsheets that evaluate Initial Coin Offerings, Twitter day-traders working through candlesticks and resistance levels, and well-branded investment newsletters. Talk of "pump and dump" is rampant, and celebrities are leveraging influence to drive coin prices. Tetras Capital penned a great article on Coindesk about the black hole of this phenomenon, and how to navigate it. One of their conclusions was that the cheaper the price of a particular token (not the marketcap, just the $ price), the better return it had in the last month. That's not a great investment rationale, and has nothing to do with technology or potential. So if you participate in this market, understand that while a technical innovation wave is indeed underneath it all, the current market is a set of options whose strike prices are based on sentiment, fear of missing out, and social media marketing bots. The antidote to dragon-chasing is data. The good news is that there are some great data providers out there. If you use Google sheets, check out the Cryptofinance plugin. To track social media activity, see Solume (and the chart below that shows the correlation between social discussion and XRP price). We are impressed with OnchainFX, Coinmetrics, Seigniorage and Iceberg for quantitative and fundamental data. The other antidote is indexing. The best thing thing that could happen in the space are boring vanilla ETFs priced at 5 bps, tracking (1) large cap, (2) mid cap, and (3) small cap coins. We track many crypto funds that are pursuing token basket strategies, but Crypto 20, Crescent Crypto and 2030 come to mind. The race is on to be the next Dimensional Fund Advisors and get your name on a business school. Much of the current price movement in crypto currencies today is speculation, which we may want because there is a precious grain of underlying technological breakthrough and innovation. For example, avoiding the Bitcoin fork was helpful to keeping the community together and correlates with a positive price impact. Or, token launch activity shows Ethereum being used for a "killer crypto app" and validates blockchain for enterprise, which should therefore correlate with a price increase. These things can be naively measured as transaction volume on the blockchainrelative to the value of the overall market supply. But on the concerning speculation side, price seems to go up regardless of whether the news is good or bad. Just having crypto in the media increases mindshare and exposure. So, for example, Bitcoin futures being launched on the CME and CBOE is in large part a way for traditional financial companies to take short positions on the price of Bitcoin. But the market is interpreting all developments in financial services around Bitcoin as positive. Or, China cracking down on ICOs mostly just puts ICOs into the news, which leads to retail investors reading about crypto coins, which creates a desire to invest, which leads to them buying Bitcoin. So there's this unintended consequence. Perhaps we can separate out technology or mindshare adoption from actual utility or financial adoption to justify the rapidity of growth, but that requires some science fiction thinking. Further, the private, public and crypto markets are connected like a Pinball machine. Valuations in the private markets for Fintech can be 5x higher than those in the public markets -- see OnDeck vs Kabbage. Valuations in the crypto markets are 5x higher than those in the private markets. 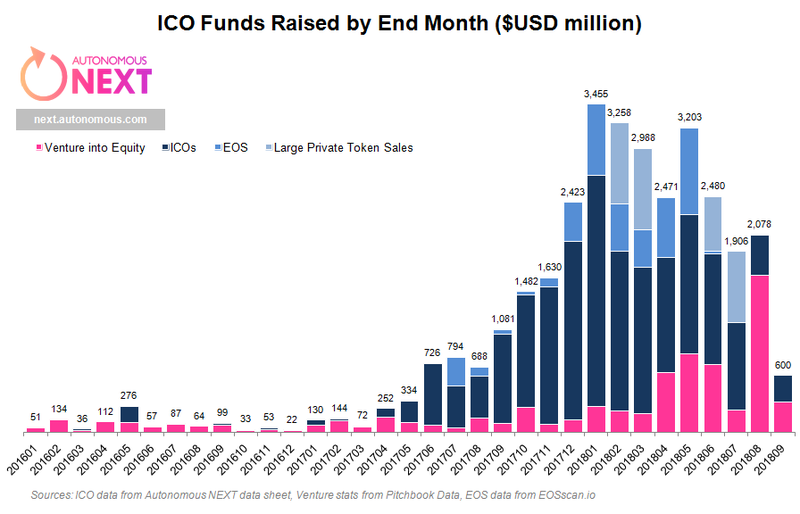 Venture investors see this price disparity, where ICO funding is driven by a near limitless supply of crypto capital gains, and some push their (unprofitable) portfolio companies to do ICOs. Because those companies have VC credibility and an operating product, like Kik for example, they raise multi hundred million dollar rounds without much effort. Venture investors have a fiduciary responsibility to monetize this, so they may exit after the ICO and lock in their pre-sale discount. Traditional fintech is also bleeding into crypto markets because fundraising is easier, there is no equity dilution, and startups can tap a narrative of actually disrupting the incumbents, rather than supporting them as vendors. As more and more companies launch ICOs, retail investors become aware of the trend. Most are not technically savvy enough to buy Crypto, other than perhaps at Coinbase. Note that Coinbase now has more accounts than Schwab. They also look in the public markets for anything resembling blockchain, bidding up assets like Overstock. Supply and demand means that very few public companies will get this asymmetric benefit right now -- thus the rush in by traditional finance to offer products that trade on regular exchanges (e.g., Van Eck). And in response, the crypto markets look at the public markets and see "the mainstream economy" adopting or pricing up crypto companies. That is interpreted as a positive development for the whole ecosystem. But it could, instead, just be capital flows looking to find a way to back an idea in low supply. You may not have been a crypto native from the beginning, so how did this whole thing get so big? The journey started with Bitcoin in 2008, stuck in incremental open source development for many years, until venture capitalists began to fund infrastructure (2012-2014) that could compete with financial incumbents (wallets, exchanges, miners). That funding proved some amount of scale, but the corporate world still did not trust a decentralized currency deemed to be for hackers and drug dealers. So by 2015-2016 there was a major shift to “enterprise blockchain”. Funding moved to corporate venture capital, and financial institutions joined consortia like R3, Hyperledger and EEA among many others. All talk was of distributed ledgers, not public markets. But while this was happening, Ethereum did its own token launch and came pre-built with a way for projects to be written in a Turing-complete development language, and to simultaneously raise money. This led to first a trickle and then a waterfall of Initial Coin Offerings leveraging the Ethereum blockchain. Much of that funding into ICOs came from capital gains in Bitcoin and Ethereum by early adopters. Fintech innovation shifted to crypto, and the movement became global. It started to involve regulators across the world, created debate among CEOs, and put something from the crypto-economy into the news every single day. It brought in Paris Hilton and other celebrities. The issue is that investing into an ICO is technically challenging. The first step is just converting USD or EURO into crypto, and Bitcoin is the de-facto winner by having the largest liquidity and biggest network. Once a user has BTC however, they have to figure out a wallet, what addresses are, how blockchain works, what an ICO is, how to invest in it, and whether to trust the provider. And last, they have to contend with the regulatory overhang and uncertainty. Thus, fiat flows into Bitcoin and very likely gets stuck there. The narrative around what is happening in crypto currency in the second half of 2017 is the entry of traditional financial incumbents into the space. 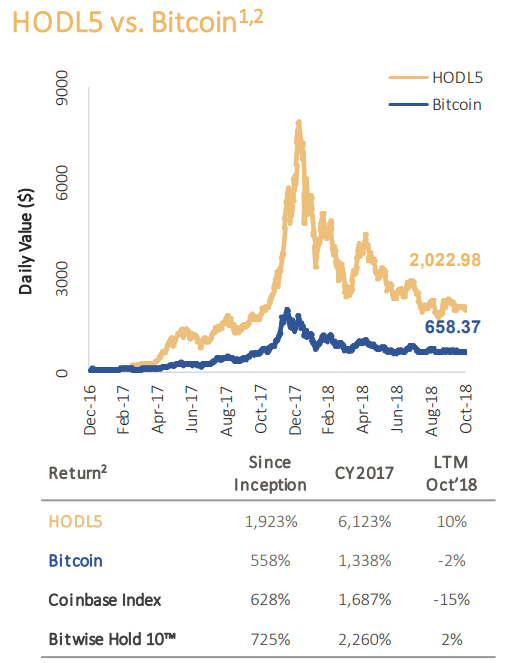 First, there are now about 170 crypto funds dedicated to crypto alone. Second, the CME, CBOE and LedgerX are all providing futures product on liquid coins. Third, asset managers are starting to build more traditional vehicles, like trusts or ETNs, so that retail investors can participate using established markets. Fourth, large public companies are fueling the story with their own developments in the space. Fifth, private capital is moving in through vehicles on CoinList and Republic Crypto. And last, the media is combining all these narratives with the price of Bitcoin, which leads to even more people getting interested in the space (without understanding it). Ethereum and Bitcoin are correlated with the overall market, so attention on any sub-part of the ecosystem catalyzes the rest. But there is also a lot of science fiction thinking about where this could end up. Will all trees be put on blockchain and their carbon production put on carbon trading markets? And of course, market manipulation, multi-level marketing schemes, and other unethical market behavior is rampant as well. What is the next stage? Regulation, rationality and legitimacy. Revolut is adding 3,500 people a day to its digital bank, reaching 1 million accounts, because it will provide the ability to store Bitcoin this December. The startup does not yet have a banking license. The concept of neobanks or challenger banks is notoriously imprecise, blending in somewhere between online banking, mobile apps, digital lending and personal financial management. Here's a try: neobanks are (1) primarily consumer focused, often with integrated budgeting, (2) mobile or chatbot first, and (3) replicate the use-cases of deposit savings, lending, and money movement. That doesn't mean they have bank licenses or need them. Plenty of tech startups can build user experiences, and API those into financial backends from firms providing bank-as-a-service. Apple did this, for example. Adding to the complexity is the emergence of cryptobanks, a set of institutions trying to replicate the functionalities of traditional banking services for crypto consumers and investors. And these things will blend together soon enough as you can see in the charts below from Financial Technology Partners and Slava Solodkiy. 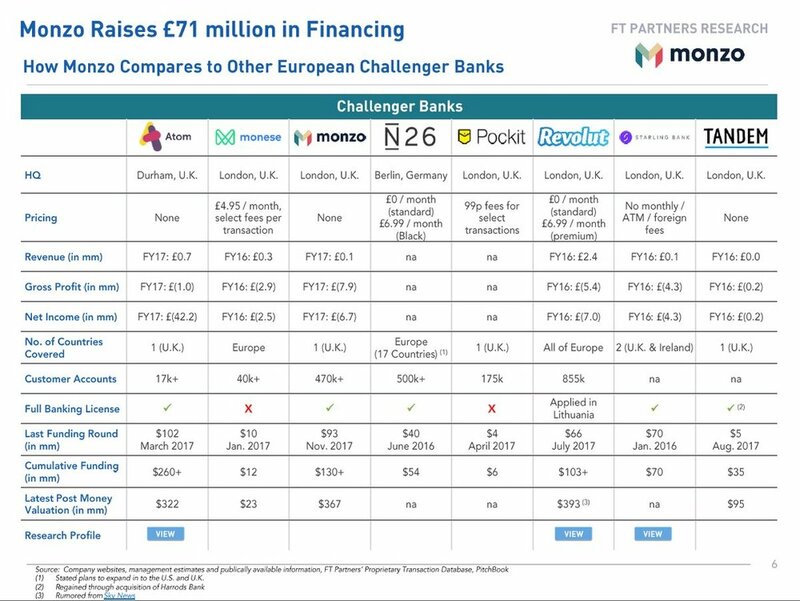 While neobank darling Monzo has raised EURO 71mm (and let's not forget Transferwise's $280mm), cryptobanks are on the path to raise $150mm this year according to Slava. If the trajectory follows ICO funding in general, we would see an exponential rise in financial institutions dedicated to crypto. Oh wait, we already do. 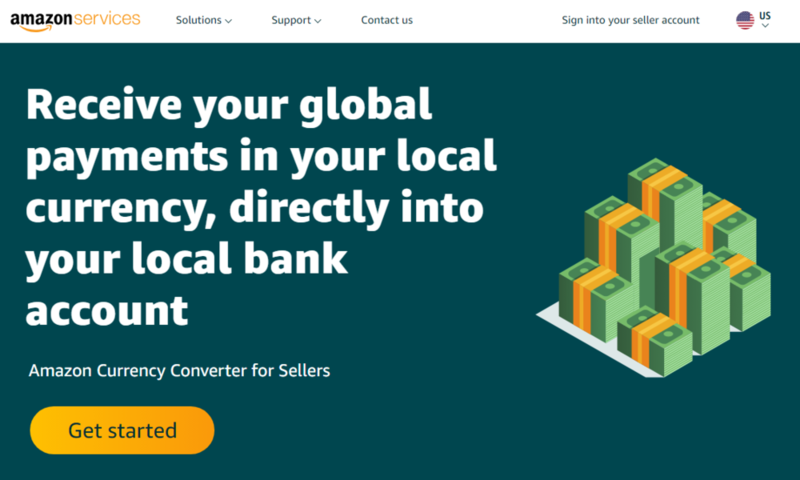 The reason that neobanks have taken off in Europe, but not in the United States, is because international money transfer can be priced at near-zero by digital challengers, pushing out the incumbents. And that matters in Europe in a way it does not in the US. A 3% credit card markup added to a 3% foreign exchange markup makes for expensive international travel. In the US, this is nearly irrelevant, which is why much more time is spent on personal financial management and roboadvising. But once we get to crypto, watch two things: (1) the use of cryptobanks in failing third-world economies, and (2) the toll booths along the crypto/traditional economy border. Hats off to Revolut for leading the way. BITCOIN: Is the Cryptoeconomy Spilling into the Real World? At a high level, we think that the most interesting things happening in the economy are around platform shifts -- mobile apps to voice skills, human intelligence to machine intelligence, and traditional economy to crypto economy. From that perspective, all you have to believe in order to see the potential of the crypto economy is that superior technology infrastructure matters in business competition. 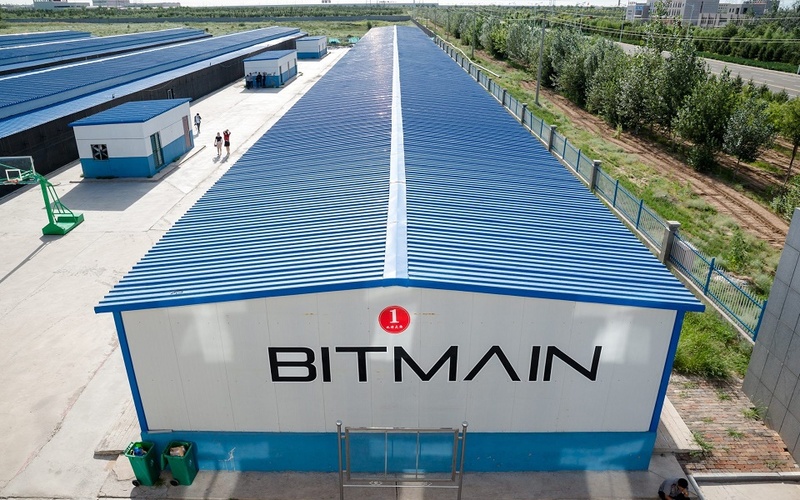 Any business not using the advantages of decentralized crowd storage, global users, consensus and trust mechanisms, smart contracts and embedded exchanges, and user-controlled attention economy is at a severe disadvantage in the world of the future. So how to take advantage of this shift? Overstock, the oddball cousin of Amazon, announced that in addition to Bitcoin, it will accept Ethereum, Litecoin, Dash, Monero, and the new Bitcoin Cash, using digital exchange ShapeShift. Can you ask for a more clear rebuttal to "I can't use crypto-currencies anywhere"? The edges between these two worlds are starting to blend, and some portion of the $100B+ in tokens will certainly be used to purchase "real goods". And a large portion of the real economy will spill back into the decentralized world. The bridges are being built. Coinbase, one of the largest digital currency exchanges, has just raised $100 million at a $1.6 billion valuation. That's instant fintech unicorn status, as well as a fair valuation for a company with 10 million users and 30 million wallets. Or alternately, see the CBOE planning to launch a Bitcoin trading product for institutional access. Or the $1B+ market cap of the Bitcoin Investment Trust, publicly traded. Or the $252 million that Filecoin has just raised in just 60 minutes from accredited investors in the United States, SEC commentary notwithstanding. This cannot be ignored.